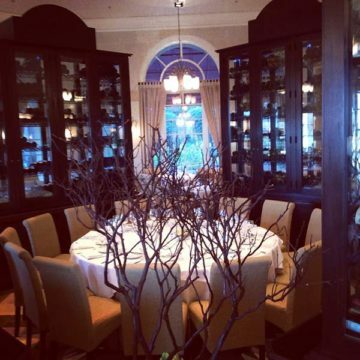 I am recalling another visit to our restaurant at the Ritz-Carlton in Orlando. I am not recalling it from distant memory but actually from a very immediate place. I love to sit in the quiet early-morning of the grand lobby of this amazing hotel and savor a cappuccino … and sometimes a croissant … and recall our always too short time and the efforts of our team and how much they seek to fulfill the same lessons my mother taught me. I am having a cappuccino now and I think Mama is proud as she watches over us from her post high above. I am often asked how I can “run” a restaurant when I’m not in that physical space every week or even every night. I understand the question. The restaurant business is an extremely personal one and I never want it to be anything less than that. What can occur over decades of time is that the “personal touch” that took me ages to learn is imbued within others. And then … through a form of shared desire and energy even more than a few on your team can “catch it”. That is what has happened here in Orlando at our restaurant in the past 11 years. What we make here is not so much as “food” or “dinner”. What we make here is a place for friendship to be enjoyed, (or discovered), grow and flourish. We seek to make ‘Tables for Friends’. For what is a restaurant’s worth if it is not a place that you can go to and trust that you will be eminently well taken care of… a place you are proud to bring your friends, your co-workers, your families and savor the good things in Life? That is the larger question. And my team answered it admirably again this weekend.